On IOU, a 36ft Enterprise, you have a choice of 4, 6 or 8 hour Fishing Charters for up to 6 people as well as their very popular 5 hour "Fish and Swim" option that includes a stop for a swim with the turtles. Drinks and snacks are included on all charters, 6 and 8 hour charters include sandwiches as well. Free round-trip transfers for all private charters. 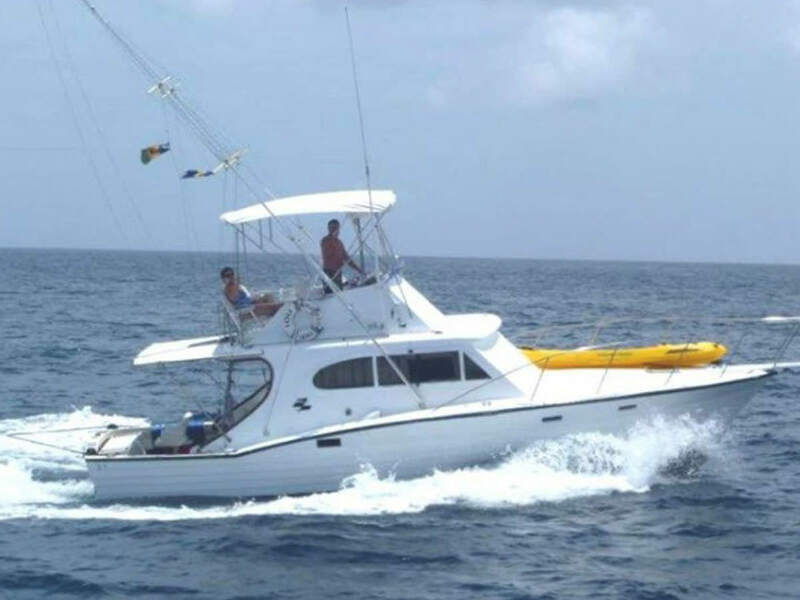 A family- owned and operated business, Barbados Fishing Charters has been in operation for many years. We grew up fishing offshore of Barbados and take pride in passing on our passion to our guests. The crew have extensive experience here in Barbados and the gear is all high quality. The expected catch while Deep Sea fishing ranges from the mighty Marlin, sailfish, Wahoo, Mahi Mahi and Tuna. Whether you're looking for a short morning trip or a whole day on the water, they have got the gear and expertise to help you enjoy a great day's fishing. Soft drinks and sandwiches are provided on the 6 and 8-hour trips, and snacks on the 4-hour trip. SWIM WITH TURTLES - You can include a stop for a swim with the turtles - a great experience that shouldn't be missed. Free round-trip transfers included for all private charters. There is a drop off within 3 miles of the shore, so you can deep sea fish without spending hours traveling to the fishing grounds. You will target a range of species, Wahoo, Mahi Mahi, Yellowfin Tuna, Blackfin Tuna, and many more. Drinks and snacks will be provided on this trip, as well as all tackle and bait too. Departure time is flexible. This 5-hour trip will have you spend half the trip fishing, and half snorkeling over wrecks or even swimming with the turtles. This is a great trip for the whole family to enjoy. Departure times are flexible. The ride to the fishing grounds is very quick, as there are deep waters as close as 3 miles to the shore. You will be able to target Mahi Mahi, Wahoo, Sailfish, and Tuna. This trip includes freshly made sandwiches and a wide selection of drinks. All rods and reels are provided, and the departure time is flexible. This trip gives you the extra time to target a wide range of species, including White and Blue Marlin, Sailfish, Yellowfin and Blackfin Tuna, Mahi Mahi, and more. Freshly made sandwiches and a range of drinks will be provided. All fishing equipment will be provided. The departure time are flexible.